We just found the ovaries – the specimen is a girl! Here’s an image from the microscope video (x150) – showing a bunch of eggs….the ovaries are full of several thousands of eggs! It would probably not be reasonable to think that judging by the other types of squid out there. In the case of the giant squid, for example, the female typically grows larger than the male. Thus, this might be the case for the colossal squid as well. right now for science im doing a project on this squid. PLEASE FIND MORE INFO!!!!!!!!!!!!! wow! the squid is so large! it is quite a confusion for me why eggs can’t be any bigger? Thank you Jean. So I assume the smaller squid have less ammonia, and thus scant traces of same. Giant squid have ammonia in the tissue for buoyancy control. Ammonia is less dense than sea-water so the squid doesn’t sink, it remains neutrally buoyant and can hang in the water column and not expend too much energy. Nobody ever answered the question as to why the “giant squid rings” would taste like ammonia. Te papa?? Does anyone know if the eggs are still good? They have been frozen. So I thought that if they could freeze my eggs, could these be good as well? In response to Sarah I understand from talking to the scientists yesterday that the flesh of the colossal squid is very delicate. The net that was used to bring the specimen up from the sea and into the boat actually caused quite a bit of damage to the squid’s body – which explains the red and white patches you can see. Cause I heard a story about an octopus they caught stealing crab from a tank on the other side of the lab room, so they videotaped it. It would wait until every one was gone and it crawled out of its tank across the room up the table into the crab tank eat one and return to its own tank as if not to be noticed. So they took the octopus and learned it could take a crab from a closed jar. So to see if it was a special octopus they put a control octopus on the other side of a partition of glass and they dropped a crab in a jar in to both octopus tanks at the same time. Their control octopus saw the other octopus once and opened his jar as well learning through the power of observation. Are squid as intelligent as octopuses? I’ll chip in to let the crew have a very well deserved rest! Re mssge 11 it is a shame she was killed but it wasn’t for research as I understand it she got caught in toothfish longlines and could not be released so she was brought back for examination. mssge 16…these squid can and do swim at the surface……that’s how she got caught! It is an amazing time to be alive! Not only in my lifetime have I seen the first monkey in space, then man planting footsteps on the moon, but now see Jules Verne vindicated once again by the netting of this deep marine child. Thanks for the cameras. Thanks for sharing the sense of wonder. Thanks for the joyful distraction from finals here at Smith College. Glued to the view from rotating camera angles I often caught myself not breathing….wow. Congratulations and a big thank you.The whole experience was so amazing for people world wide who were watching and listening and reading the blog.This enabled us to know every piece of information about all the squid specimens,especially the large colossal squid specimen,at the same time as all the scientists and squid experts etc found out.I could not get over that it had a lens and eye that huge and finding out that it was a female specimen and has all those eggs in its ovaries is yet another exciting piece of information.Well done to all involved for making this a world wide event and for making the experience so educational. Ref. message 13 above – from Gabriel. Perhaps it might be kind of you to find her before she (or is it he?) completely loses her marbles and bring her into the real world. Remarkable pictures. Are these the creatures which I’ve heard have left scars on large whales ( and depicted depicted in medeval maps and drawings attacking ships) or is there any possibily of an even larger relative? Thanks for that Jeffrey, I didn’t really think I would bump into one at Lyall Bay. Michelle, you wouldnt anyway, they live right down the bottom of the ocean where it is basically pitch black. Thats why they cannot really go down with a camera and light to screen them in their natural environment, too many risks that they may not act naturally and we will not get to see what they are like in the wild. The lady has been found in February 2007 and kept frozen ever since, so that’s one year and 2 months. 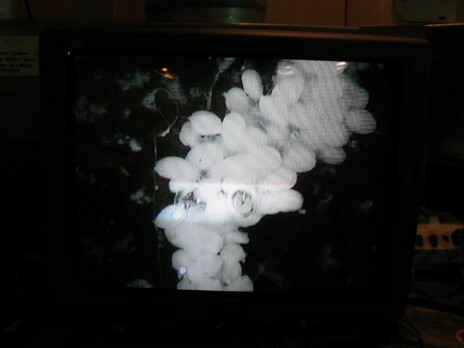 wow the eggs are amazing, thats a whole lot of colossal squids out there if they hatched. It is amazing that we do not see more of these creatures found, they certainly keep to themselves which isn’t a bad thing considering their size…I certainly wouldn’t want to come up against one in the ocean. Those eggs look viable. How long where they frozen? Wow, they might be able to grow them in captivity. At least from the D.N.A. They could probably clone them. Why? You could train them to take out submarines. I imagine this has already happened accidentally but the events would be classified. Then perhaps the tsunami was a nuclear accident, I don’t suggest such an unlikely scenario to be humorous but to help expand understanding in the state of world affairs now. Not only are these ideas possible, because of the exponential rate at witch technology increases they are actually inevitable. This has been fantastic. Thank you all so much. I don’t feel that they should have killed such an animal even though they are examining it for scientific purposes. It’s a shame that this female had to be killed and her ovaries were full of eggs. There could have been many more. What a shame. Hey, thanks for the view! From Philly (PA, USA) it’s a grand site! 🙂 Told ya, it was a girl — smile. Thought of any names for her, yet? I am most interested in knowing how old she is. It was mentioned that she may be around 2. Will you be looking into that? Counting rings(?) which seems such an unexact science when it comes to squid. And if she is so young, what would her growth rate per month/year be? A whole lot of growing, to be sure!!! All in all, though, it’s been absolutely AMAZING and I thank you for all that it is that you do! okay.. this is fantastic! i have followed articles in the geo magazine and online and i even watched the bbc earth dvd collection. every time a report was finished i knew a lot more about squid and “monsters from the deep sea” but there were always just a few images or animations. so, thank you very much for sharing this one-time event! i hated biology in school after a couple of years and nothing but interesting facts about our planet and its wildlife, nothing is greater or more interesting than exactly this! by the way, greetings from madrid, spain, even though im actually from germany and simply doing an internship here, i have been caught up online for the past days, just like a few here.. my bosses will kill me! please keep sharing! thanks and good luck! This colossal squid will actually not be dissected in order to be as intact as possible for its display at Te Papa later this year. Would it be reasonable to assume perhaps she’s as large as a female gets and perhaps the beaks found in sperm whale stomachs (ouch btw…) could be from males? Oh and I have a question about the colour… was she originally dark red all over, or always the red and white irregular blocks of colour? I guess her skin could have been damaged quite a bit? Very interesting viewing guys, keep up the great work! That was a terrific way to spend the day – I’ve been watching nearly since it started! Goodnight, scientists, and goodnight, squid! I would just like to say thanks for letting us watch this fantastic event! Until now I had never been much of a squid fan (found them a bit yuck to be honest), so I was shocked to find myself glued to the computer for the last three days! Looking forward to seeing her at Te Papa. Wow thats awesome, are u guys preparing the table for the disection of the squid?